You have added Tulip Garden Strapless Belted Dress in Black/Ivory into shopping cart. This pretty dress has awesome details that make it one of our very favorites! The Tulip Garden Strapless Belted Dress is made of a thick, substantial fabric at the bust. It has a strapless neckline with a unique crossover fabric design at the bust that reminds us of a tulip. Boning at the bust gives this dress structure and the V dip in the center adds a flirty touch. The empire waist gives way to the flowy chiffon skirt in a contrasting color. The included belt wraps around the waist and ties the whole look together. A hidden back zipper completes this dress. 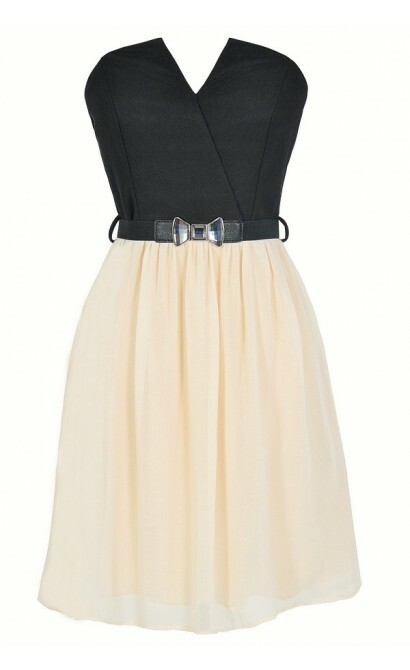 The Tulip Garden Strapless Belted Dress would look nice paired with pumps or strappy heels and a clutch. 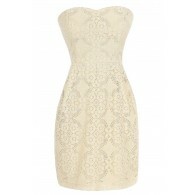 This is a simple dress that makes a big impact! Details: Made in USA. Skirt is fully lined. Boning at bust. Hidden back zipper. Belt included. 100% polyester. Shell 2: 94% polyester, 6% spandex. Lining: 100% polyester. Hand wash cold or dry clean. Small measurements: Length from top of bust to hemline: 27”. Bust: 32”. You have added Tulip Garden Strapless Belted Dress in Black/Ivory into Wishlist. You have added Tulip Garden Strapless Belted Dress in Black/Ivory for Stock Notification. You have set Tulip Garden Strapless Belted Dress in Black/Ivory as a loved product. 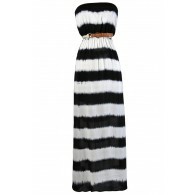 You have removed Tulip Garden Strapless Belted Dress in Black/Ivory as a loved product.